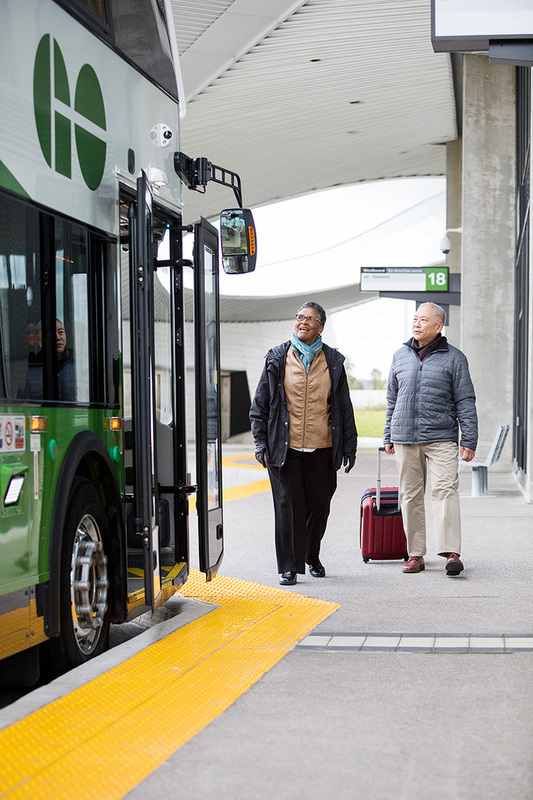 The largest GO bus terminal in the Greater Golden Horseshoe is now open, connecting you what matters most, better, faster and easier. 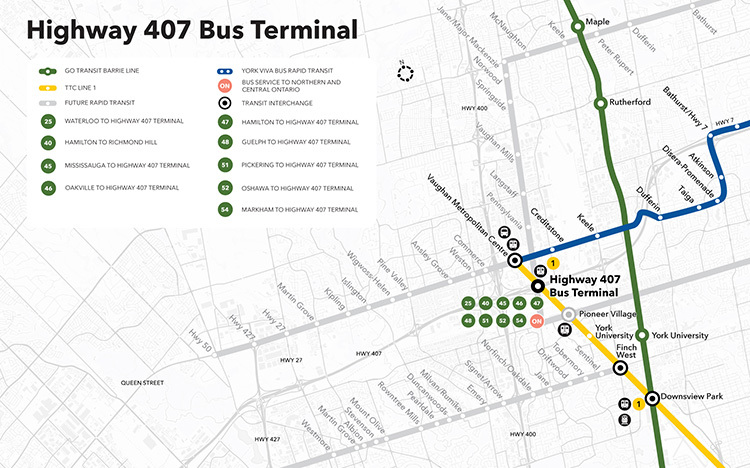 Metrolinx has partnered with the TTC to deliver the new Highway 407 Terminal, connecting bus and subway, in a brand new facility. Located at Jane Street and Highway 407, the bus terminal brings GO, YRT and Ontario Northland directly to the TTC subway, while allowing you to connect and travel in a modern, comfortable experience on GO bus. This is your local launching pad to an entire regional network, taking you to every corner of our region, and all the opportunities that come with it. 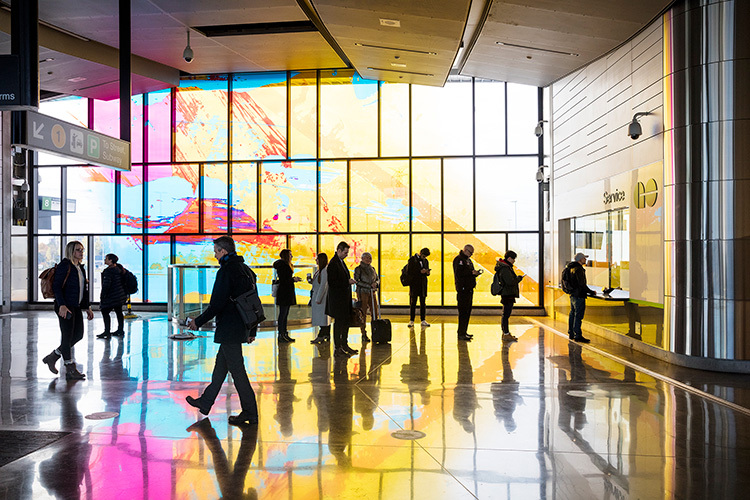 The terminal is a multi-modal transit hub hosting TTC subway, and allowing you to use GO to get to York Region, Hamilton, Mississauga, Oakville, Waterloo, Guelph, Durham Region and beyond. Spend less time getting there and more time doing the things you love. The terminal includes 18 covered bus bays (13 for GO Transit and 5 for YRT/VIVA), a customer service counter, and PRESTO ticket vending, and real-time service display to keep you on time. Simplify your commute by accessing transit right off the highway. You’ve got easy access to approximately 600 TTC parking spaces, 14 accessible parking spaces, washrooms, a pick-up and drop-off area, bike storage, elevators and escalators that will seamlessly connect to the subway, and a barrier-free pedestrian path leading to the main entrance that is separated from vehicle traffic, ensuring your safety. You can’t miss it. A bold design for our region, the station’s design includes a sloping terminal roof, glazed glass to ensure it is bird-friendly, an indoor customer waiting area, , as well as coloured and textured concrete. The interior of the bus platforms and waiting area are constructed with white ceramic panels, with doors painted to match. It’s a bright and comfortable experience. GO bus service information can be found here. TTC information can be found here. YRT information can be found here. Ontario Northland information can be found here.